I wrote this for a travel magazine a while back but wanted to re-publish for my readers here. Enjoy! America’s candy history started long before early colonists threw out their English tea and began to drink more cocoa. Native Americans specialized in small batches of maple sugar candy. By the turn of the century, Milton Hershey was producing a 5-cent milk chocolate bar available to the masses. Today, many local confectioners are hard at work making their sweet stuff the traditional way while many are adding innovative twists to classic favorites. Nestled in the heart of Amish country is a sweet secret. Here you’ll find Wilbur Chocolate’s store and museum. Wilbur Buds are the company’s most popular and treasured treat. While sampling your chocolate stash watch while plump marshmallows are dipped into vats of creamy chocolate in Wilbur’s vintage style candy kitchen. Their vast collection of beautiful antique candy tins, cocoa artwork and advertising will captivate. Located on Christopher Street in New York’s West Village for more than 80 years, this confectioner recently moved to a brand new Greenwich Village location. What hasn’t changed is their quality candy. 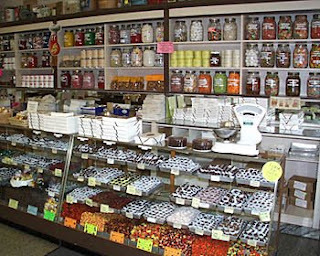 From fresh fudge to French Rolls, they still make chocolates the old-fashioned way using formulas developed in 1923 by Li-Lac's founder, George Demetrious. For additional sweet satiation head uptown and slip into Dylan’s Candy Bar for a real candy extravaganza. The historic Ferry Building Marketplace located along the Embarcadero at Market Street offers everything from artisan cheese to fresh local fish. This gourmet mecca is also the sweetest spot in town. Miette Patisserie is a dainty little pastry shop offering handmade cupcakes and cookies. Located right next door you’ll find Scharffen Berger Chocolate Maker. This fine chocolate shop carries handmade chocolates and bars, cocoa powder and sauces. If you have room be sure to stop by Recchiuti Confections for a lemon verbena chocolate. With three urban locations lucky Chicago visitors will never be far from a Vosges Haut Chocolat store. Daydream and indulge in their retro style lounge in Lincoln Park. With flavors of curry, black sesame and rum, Vosges’ tasty truffles will take you to India, Japan and Jamaica. Vosges' exotic truffles are made from the freshest and finest ingredients, each hand picked by owner and master chocolatier, Katrina Markoff. The Schimpff family has been making candy in Jeffersonville since 1871. Their unique shop in Jeffersonville's downtown historic district comes complete with a 1950s soda fountain. Old-fashioned candy jars and turn-of-the century equipment instantly transport you back to the good old days of homemade sweets. While there, check out Schimpff's impressive collection of American candy memorabilia and take home a tin of Horehound Drops.